For over 30 years, Tennis Fantasies has offered this once-in-a-lifetime chance to mix, mingle and play with the greatest Legends in tennis! 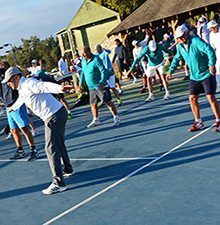 Participate in clinics, team competitions and pro ams with tennis greats like John Newcombe, Rod Laver, Roy Emerson — and several other top names – who share years of experience and Grand Slam titles. Men’s only event (October 20 – 25, 2019) features 13 tennis Legends. 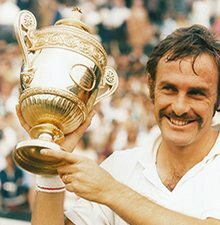 Mixed Men’s/Women’s event (March 5 – 8, 2020) includes John Newcombe, Roy Emerson, Owen Davidson, and Ross Case. For the ultimate tennis experience that you’ll want to experience again and again, make plans now to join us at Tennis Fantasies, the original tennis fantasy camp. Register now by calling 1-800-874-7788. Improve your game, meet the pros, and make memories. Established in 1968, by tennis Legend, John Newcombe, the Tennis Ranch has evolved into one of the premier tennis destinations in the world. 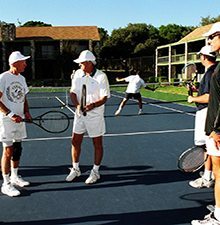 Nestled in the rolling Hill Country of Texas, the Ranch offers year-round junior tennis camps, adult tennis vacations, a world class tennis academy and fantasy camps with tennis Legends.